Even though a thermostat is one of the least expensive items that you will buy when you buy a heating and air conditioning system, it is very important because it is the interface between you and the heating and air conditioning equipment. We would suggest that you purchase a thermostat that can be run as either a programmable or a non-programmable thermostat. The difference between the costs is very little. If you do decide you want to save energy by programming lower temperatures when you're away from the house and when you go to sleep at night, then you can receive those opportunity cost savings. We definitely recommend that you purchase a digital thermostat that contains no poisonous and polluting mercury and is also much more accurate. If you buy one that is continuously backlit, you can see it at night or in hallways with large easy to see numbers. Our favorite thermostat is the P3741100 from Totaline. Totaline is a division of Carrier Corporation that specializes in accessories that can be used with anybody's equipment. 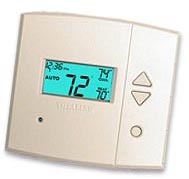 Therefore, you can purchase any brand of equipment and still purchase this excellent thermostat. For very little more you can also get the thermostat to read not only the indoor temperature but also the outdoor temperature. For special applications, such as a bed ridden person in your house, or if you would just like to have your thermostat right by your bed, you might want a wireless thermostat that can be put anywhere in the house and maintain the temperature of that space.